The Gallbladder: Does Candida Increase Your Risk of Gallbladder Disease? 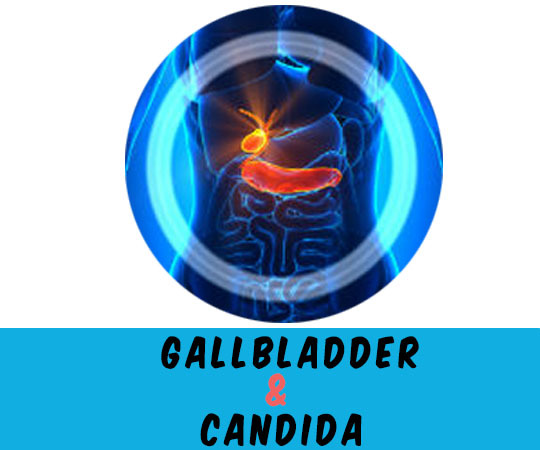 - YeastInfection.Org by Eric Bakker N.D.
You are here: Home / Other Issues / The Gallbladder: Does Candida Increase Your Risk of Gallbladder Disease? The gallbladder is largely a storage container for bile produced by the liver. Bile is a mixture of salts, bile acids, phospholipids such as lecithin, cholesterol (produced in the liver), bilirubin and a number of other substances. Bilirubin, which gives bile its yellowish-green color, is a breakdown product of hemoglobin, the iron-containing protein that carries oxygen to the cells and carbon dioxide to the lungs. Bile acids or bile salts are essentially a detergent to allow for fat absorption—and fat excretion. One of the main routes for lowering cholesterol levels is via the bile. Another vital function of bile is to help excrete various toxins that are either a natural by-product of cellular metabolism or come from other non-natural sources such as drugs, environmental toxins and toxins produced by bacteria, viruses and fungi like Candida. The bile produced by the liver enters the gallbladder through either the cystic duct or the common bile duct and, after meals, flows into the first part of the small intestine (the duodenum) to mix with the partially digested foods and support the absorption of fats. Gastric hormones such as cholecystokinin (ko-le-sisto-kinin) and others stimulate the gall bladder to release the bile. Most gallstones are mainly made up of cholesterol. If the liver is secreting a high level of cholesterol and the cholesterol gets highly concentrated in the gallbladder, cholesterol-containing gallstones can occur. Other gallstones contain high levels of calcium, bilirubin and pigments. Gallstones can also be mixed, containing cholesterol and calcium salts. Many times, gallstones do not cause any symptoms at all. If the gallstones do cause pain, it is called biliary colic and usually begins suddenly during or right after a meal. Cholecystitis is an acute inflammatory condition with shaper pain in the upper right part of the body (beneath the ribs). Cholecystitis also usually comes with a fever, nausea, vomiting, a rapid heart rate and sweating, sometimes profuse sweating. The pain can feel as if it is also coming from your right shoulder or right side of your back. The pain often begins after a meal, commonly a large or fatty meal such as fried chicken. What are the Risk Factors for Gallbladder Disorders? Gallstones are more common in women and are associated with obesity, pregnancy and increasing age. Other risk factors include ethnic background—white, American-Indian and Mexican ethnic backgrounds tend to increase your risk. In addition, diets that are high in fat or cholesterol can put you at a higher risk for gallstones. Another risk factor is rapid weight loss. Gallstones are also closely associated with metabolic syndrome, insulin resistance, type 2 diabetes, high blood pressure and high levels of triglycerides and other fats in the blood. Some medications are also associated with a higher risk of gallstones—these medications include oral contraceptives and some medications that are meant to lower blood cholesterol—these include clofibrate and other fibrate-type drugs. People with certain blood disorders such as sickle cell anemia and hereditary blood disorders including hereditary spherocytosis and beta-thalassemia. Intestinal disorders like Crohn’s disease can also increase the risk of gallstones. How are Gallbladder Disorders and Gallstones Diagnosed and Treated? Gallstones can be diagnosed using contrast imaging such as a hepatobiliary iminodiacetic acid (HIDA) scan, magnetic resonance imaging (MRI) or endoscopic retrograde cholangiopancreatography (ERCP). If gallstones are detected during an ERCP, they can be removed during the procedure.3 If the gallstones are relatively small, medications can sometimes be prescribed that can dissolve the stones. Treatment often includes surgery—sometimes to remove the entire gallbladder, depending on the severity of a person’s condition. If the gallbladder is removed, a person should consider using special supplements containing (often) bile acids and various other substances such as lecithin and enzymes to help digest and absorb fats. Technically, one doesn’t need a gallbladder to survive, but taking these specialized supplements can help prevent diarrhea that often occurs after gallbladder removal and can help ensure that you can digest and absorb fats (and, importantly, fat-soluble vitamins such as Vitamin D, E, A and K). Cholecystitis, inflammation of the gallbladder, is usually caused by gallstones. It can usually be diagnosed by a combination of the types of symptoms, blood tests and various imaging tests such as a HIDA scan. The HIDA scan can follow the production and flow of bile from the liver to the gallbladder and small intestine. This scan uses a radioactive contrast dye into your body and can reveal gallstones and other blocks to the flow of bile. Most people with cholecystitis are admitted to the hospital and often given pain medication. They may also get antibiotics if there is evidence of an infection. You won’t get any food though—the idea is that fasting will give your gallbladder a “break”.4 Surgery may also be needed. So, while there is not a lot of medical literature available at this point, it is theoretically possible that individuals with gallbladder disorders or recurrent episodes of gallstones, especially with a combination of the risk factors listed above, may also be at risk for candida infections. The reverse may also be true—those with recurrent candida infections may be at higher risk for gallbladder disorders. While there are currently few reports providing solid evidence that candida can transform in the body to the mycelial form, forming invasive hyphae,9 it is possible that candida overgrowth could result in liver and gallbladder damage and predispose individuals to gallbladder disorders and gallstones, particularly in those with subclinical immune suppression and more overt immune suppression. Dietary approaches can both help boost the immune system and minimize the risk of developing gallbladder disorders and gallstones. Boosting the immune system can be vital to controlling recurrent candida infections, can help repopulate the gut with helpful bacteria (which can also limit candida growth) and can reduce any stresses on the liver. In addition, avoiding fatty foods (but ensuring that you get enough healthy fats); increasing the fiber in your diet; maintaining a healthy weight and losing weight slowly if you need or want to; and including nuts in your diet can all help to minimize your risk of gallstones. A candida-reducing diet should be a low-sugar diet because candida loves sugar almost or maybe more than you do! You should also avoid all processed foods or better yet, eat all organic foods to minimize your exposure to immune-suppressing additives and pesticides. Increase the amount of fiber in your diet and avoid any fatty foods, especially fried foods. Your fats should come from fish or from plant sources (eg. olive oil). Include fermented foods and/or probiotic foods to replenish and support healthy gut bacterial. Include nuts for their healthy fats and high levels of vitamins and minerals. Include anti-fungal herbs such as onions, garlic, ginger, cinnamon, oregano (and oregano oil), and turmeric. So while the science has not yet caught up with the experience of people with candida, following the dietary approaches will help boost your immune system and decrease your candida load. In addition, if you ARE at risk for gallstones, these approaches can decrease that risk. Finally, don’t forget to exercise AND get plenty of rest! Here is a video of Eric Bakker explaining how to do a proper Gallbladder Cleanse. Lilic D, Gravenor I, Robson N, Lammas DA, Drysdale P, Calvert JE, et al. Deregulated production of protective cytokines in response to Candida albicans infection in patients with chronic mucocutaneous candidiasis. Infect Immun. 2003 Oct. 71(10):5690-9.